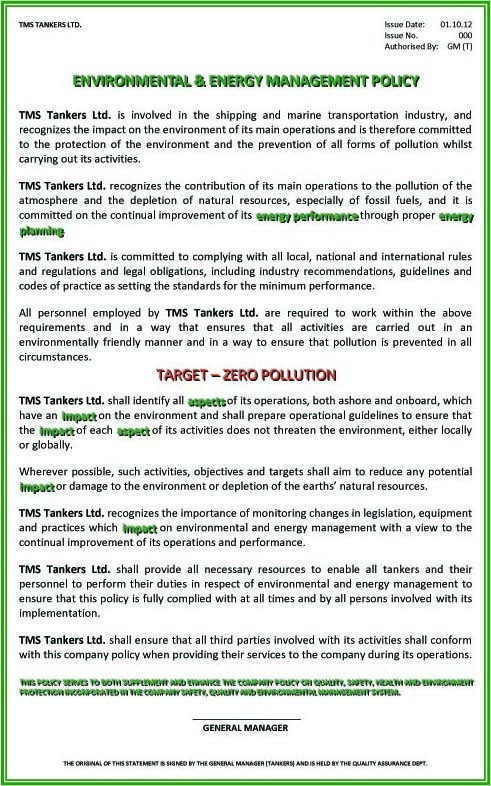 TMS Tankers Ltd., as the one of the world’s leaders in the shipping industry, recognizes the impact on the environment of the transportation of oil. We are committed to the protection of the environment, the prevention of injury and illness, the health, security and safety of all our employees and our business partners and the prevention of all forms of pollution whilst carrying out its activities. Encourages company employees and contractors to adopt safe work practices, comply with Health, Safety, Security, Quality and Environmental policies and procedures and report hazards and unsafe work practices. Conserves the environment and protects health and safety, by complying with all national and international rules and regulations and legal obligations, including industry recommendations, guidelines and codes of practice as setting the standards for the minimum performance, and when possible even establishing tougher policies. Protects our people, our principals’ assets, and our business partners’ interests from threats to their security by applying appropriate actions. Continuously assesses and evaluates work to verify conformance of the HSQEMS to policies and requirements in force. Continual improvement is achieved by monitoring our performance on an ongoing basis via Safety and Quality Key Performance Indicators. © 2019 TMS TANKERS LTD. All Rights Reserved.